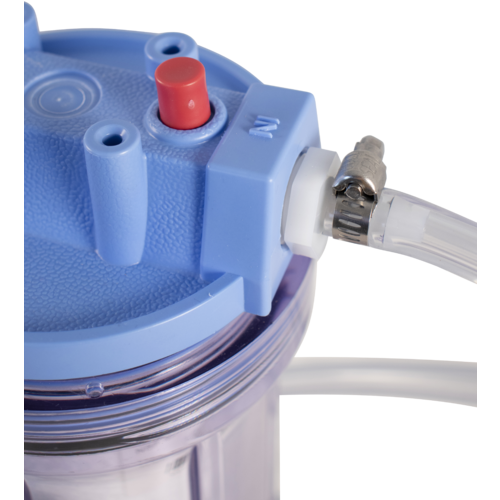 This cartridge filter is designed to be installed inline between two ball lock Cornelius kegs. The design uses Argon or Nitrogen gas pressure to push wine out of the full keg, through the filter and into the clean keg. 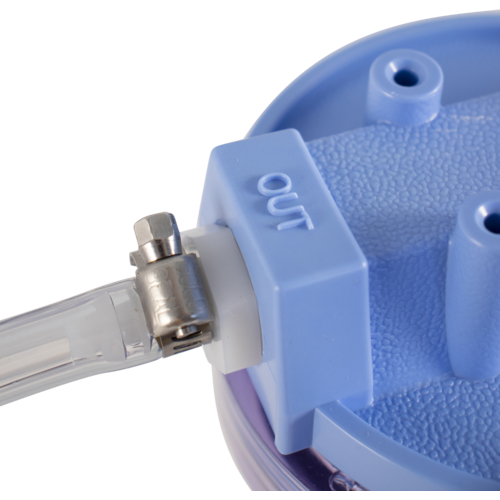 This kit includes a cartridge to filter out particles down to 1 micron in size, which is considered a "fine" or "polish" filtration. This is a fine place to start if your wine is already naturally very clear from successive rackings, or you have pre-fined the wine. If you do not wish to wait for racking to be effective or to pre-fine the wine ahead of filtration, MoreWine! 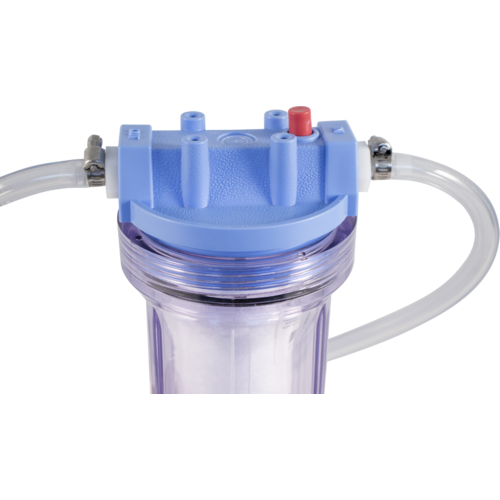 suggests that you start with either our 5 micron or 3 micron cartridge and put the wine through successively finer filter media until you reach your desired level of clarity. 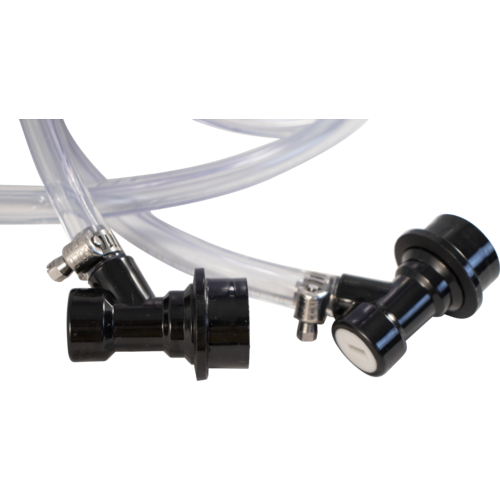 The Beer and Wine Filtering Kit comes with one 10" filter housing, a 1 micron 10" spun poly sediment filter, fittings for connection to the filter housing, 3' of beverage line, clamps, and two beverage out ball lock quick disconnects. Spun-polypropylene filters are disposable filters and cannot be effectively cleaned for reuse. However, you can filter multiple kegs with one filter cartridge. Most customers report being able to filter 10-15 gallons of product, however you should be aware that your results will vary depending on the cloudiness of your beer or wine. 5-10 micron is considered rough filtration, 3 micron will remove most yeast, and 1 micron filtration will remove almost all yeast. All filters are rated nominal (will filter out 80-85% of matter at given rating). I wanted to make a clearer beer without waiting forever. Required by third-party product inspection for "stop fermentation" step. Would have been a 5 rating but I did not check the connections before I put it to use and had product everywhere because one of the clamps was not ratcheted down all the way. We have a difficult time getting a good seal when screwing down the top. This results in leaks that get worse as the filter housing cools down from the cold beer, and then we have to tighten it again - usually it takes two people to get it tight enough. I am glad that I have the filter housing, filtering the beer is really valuable if kegs are going to events. But it is not as easy to use as I had hoped. The first try yielded a beer-drenched-kitchen and soaked hobbyist-brewer. The "O" ring that came with the filter was crimped when I opened the housing and I SHOULD HAVE been more cautious. Nonetheless I trudged ahead and the resulting bad-seal caused a shower of wort-laden brew all over the place. I complained to Customer Service. They were great in responding with a sympathetic tone AND sending me TWO "O" rings! Long story short. I installed the ring, connected the two OUT ball locks and SLOWLY ramped up the pressure to push the sediment/liquid through the filter. People say they had leaking but I filtered 50 gallons of beer (5 - 10 gallon batches) in one day and never had an issue. Used 3 micron filters with all my beer. I've used this many times and have had very little issues. Still tinkering to use it as a hopback but for what it's meant for, it works great! Used it for 3 batches. So far i feel the filter has improved each beer. I have used this multiple times on both new and carbed beer and it gets the job done every time. Having the ability to use different micron filters is a plus. Used this once on a ten gallon batch. I cold crashed for 4 days before, transferred to kegs, then ran thru the filter. I though the filter was going to come out filled with sediment, but it wasn't that bad. Had a little leak at first, but a little tighter twist solved that. Will probably use on all my batches from now on. I ended up turning it into a Randall to push beer through hops because now I cold crash in the fermenter to clear the beer before kegging. I purchased the filter set up to test out filtering my brews into the keg. The unit is quirky and takes a lot of fine tuning to get it to work efficiently. I finally gave up and stopped trying to filter. The housing works with filters for you water supply, so it wasn't a total waste of money. I've been brewing for 10+ years and until I used this item a few months back had never bothered to filter before. I find myself traveling with more kegs lately and even after cold conditioning, once the keg gets shaken up a little it ends up cloudy. I brew 20 gallon batches and have used the filter twice now and when used on all 4 kegs it's running fairly slow by the time it gets to the last keg (filter getting clogged). I agree that if I were doing 5-10 gallon batches, $4-$6/filter wouldn't make a lot of economic sense but putting it to use for 4 kegs at a time I figure I get good value from it. So far have only used the 3 micron filters. I've recorded no leaking and don't see how the lid would be easy to cross-thread. I do agree that it would have been better with flared fittings to be able to easier clean. I used this a couple times. I probably used it too quickly. After racking to a keg, let any conditioning that you want take place and then chill it before filtering. It works good enough for home brewing. I just brewed my first IPA and used my conical for the first time. After cold crashing the beer, dumping the trub and yeast, and racking into a keg, I still had a ton of sediment floating around in the beer. This prompted me to look into some sort of filtration system. I settled on this one and I'm glad I did. I filtered the beer using the included one micron filter. The beer not runs into my glass with just a slight chill haze but absolutely NO sediment resting at the bottom of the glass. Overall, extremely satisfied with this product. The unit leaks even under low pressure (5#). Needs constant monitoring to not lose your product. Always put in a large pot while in use. I have tried 1 & 3 micron filters with just so-so results. The finish was not good. Hose clamps in sited of permanent tooled clamps and plastic fittings. Not what was in the picture. Looks like something someone put together in there garage. I could have built some thing nicer. It does the job but has alot of waist too. I bought this to filter out some of my homebrews prior to transport/bottling. If I moved my IPA kegs I was having issues with them spewing hop junk left over from dry hopping. I've successfully used this to filter several batches with great success. You loose a little flavor with the filtering but the recipe can be adjusted to compendsate ahead of time for this. Great product. I now have 3 of these. One for water, one for filtering beer and one i have set up as a randalizer. Other than a fitting leak (corrected with Teflon tape) all 3 have worked well and are easy to use. I had no problem filtering 10+ gallons with one filter. A variety of filters are readily available and relatively cheap. I have found that using to fine of a filter that some flavor is removed, but the finished product is sparkling clear. I am fortunate enough to not have the issues some of the others mention (leaking). This filter worked perfectly for me, even on my supper hoppy Enjoy By clone (6 oz dry hops for 5 gal batch). Not a problem! Eliminated the hop sediment (after having to clean out my clogged dip tube). Just beware that by using this, you will have to be prepared to lose a beer (or two) that doesn't make it from the filter to the keg when done. This filter did not come with the main O-ring! Not only did it leak bad. I lost beer and had a big mess to clean up. Also wasted the filter! !You would think that if you spend $49.95 for this IT WOULD INCLUDE THE O-RING !!!!!! I am certain, if you called them and explained, that they would have rushed to you the o-ring that was missing. if ever a product lacks or is not what I expected, these folks have taken care of me. Give them a chance if you haven't already. this filter works fine if you are in a hurry and have to filter your beer quickly. i still prefer the cold conditioning much much more, it will drop everything out of suspention but if you dont have that kind of time use the filter. I've been using this filter system for a couple of years. It works great, though you do need to take some care when screwing on the cap. 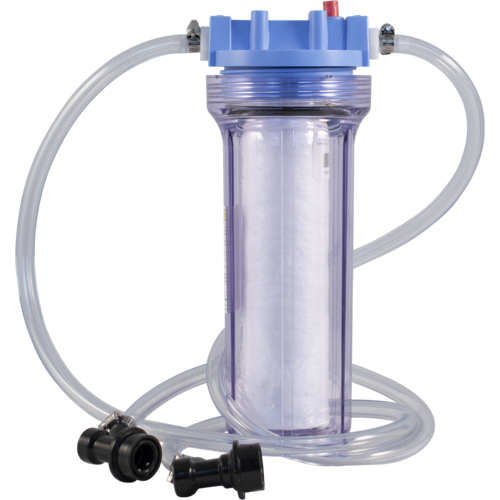 I've used it with 1 micron filters and usually filter 10ga of beer on a single filter. As long as you use a filter wrench to tighten the lid, I have not had any issues with leakage. Works, easy to use. Filter size is common. This filter is pretty simple to use. I have found that mine leaks quite a bit because the O-ring is slightly too large and does not provide a good seal. I lose approximately 3-4 pints out of a 15 gallon batch to this filter just in leaks. I've used this many times and the filtering of the beer for the most part has yielded positive results. I'm only brewing 5 gal at a time so reusing cartridges becomes problematic and a little costly (on a per brew basis). You've got to make sure the lid doesn't get cross threaded (which doesn't take much) or you're going to have some pretty good leakage. Keep the filter in a bucket/pot just in case. This filter works fine but a little bulky overall and I've not used it as much as anticipated. Quality product but just not that convenient for me. Purchased this recently over the plate filter and it works like a charm. Easy to use, easy to clean. Filtered a beer after chilling it in a keg, no CO2, for one day. Found the pressure relief valve on the kit helpful, too, when dialing in the proper pressure to filter. Yeast and hop particles were all filtered out by the included filter cartridge and the beer looks (and tastes) great. No haze either. This should come with threaded connections for pin or ball lock kegs to be connected. Love the filter just wish it had quick release on the tubing so I can switch back from beer to water.